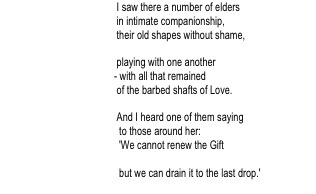 It is fitting that we host a session on ageing in Ireland in a summer school dedicated to an Ulster poet, Patrick MacGill, one who not only had a keen sense of social justice and the unspoken narratives, but also insight into the positivities of ageing, as we can see in this extract from his poem Slainthe. Summer schools, with their mix of arts, advocacy, politics and academia, are a recognition that life is complex, and that a broader and deeper forum is needed to explore such matters, and no stage of life is more complex than later life. A focus on poetry is also apt. As Yeats said: “We make out of the quarrels with others, rhetoric, but of the quarrel with ourselves, poetry.”, and much of the perceived challenge of ageing arises from our individual ambivalence about our own ageing. This is truly surprising if we look at the facts underlying longevity, the greatest social advance of the 20th century. In a time-poor society, our increase in lifespan (approximately an extra two years every decade) means that we have been granted the equivalent of an extra five hours a day, a 29 hour day compared to that of our parents. In addition, it is increasingly clear that we are living not only longer but also fitter, with less significant disability, and perhaps most intriguing of all, with less dementia. In a major US study, the incidence of dementia has almost halved over 20 years, largely associated with better education: little did Donough O’Malley imagine that the legacy of free secondary education would have such far-reaching consequences! Yet we all know that ageing also carries with it inevitable age-related disease and disability as well as ultimately death, and how are we to reconcile the longevity dividend with our existential vulnerability? T.S. Eliot spoke of each issue in life raising two questions: the first is “What shall we do about it?” and the second is “What does it mean? How does one relate to it?”. The latter is clearly the more important question, and my challenge to you today is a) do you truly believe in the longevity dividend, b) do you truly welcome your own ageing, and c) do you understand and embrace your existential vulnerability? As a schoolboy and young adult, I was seduced by the beauty of the language, its compression of a world of bereavement and loss into a few spare stanzas, its juxtaposition of the urban and the celestial. Yet as a geriatrician, and increasingly as the son of an aging and eventually dying father, I was aware of a growing unease with the allusion. For in my practice, not a single older man I saw in more than two decades of practice ever reminded me of my father, a truly remarkable and individual man who defied pigeon-holing as a Stradivarius defies replication. Not only that, but one of the rewards of working with older people is that not a single older man I had ever seen truly resembled another, a reflection of the key gerontological principle that an increase in inter-individual variability is one of the defining characteristics of aging. Born as copies, as we say in the trade, we die as originals, and in every department of geriatric medicine I have ever worked in, this formula provided an unstated but rich counterpoint to our work. For geriatricians, the work/home divide in this regard is more porous than for any other specialty — the cardiologist and endocrinologist may have no one in the family with either heart disease or diabetes, but virtually every geriatrician has older relatives and is both an observer and a participant in the aging process across generations, simultaneously watching the enrichment of the life course review and the losses of aging. Yet in all of our own homes, whatever our specialization, this truth is inescapable: was your grandmother really like anybody else’s? At one level, a group of intelligent and sensitive people (most of whom, thanks to the longevity dividend, presumably have not only remarkable parents but also highly individual grandparents, uncles, and aunts) fails to engage with the remarkable complexity of aging, but equally seriously, neglects the abundant evidence that tackling this complexity in a systematic way reduces death, disability, length of stay, and institutionalization. The danger is that we allow this complexity to be brutally abbreviated into caricature, generally one of two kinds. The first is that of miserabilism and loss, of a tsunamai of burden on income, health and social welfare systems: indeed, the very framing of this seminar in the programme to a certain extent misportrays ageing as a challenge in this manner. This has generated a toxic burden of myths about ageing: a) that ageing of the population increases health care costs , b) that pension costs are unsustainable , c) that older people are unproductive and a net drain on the economy , d) there will be a massive increase needed in nursing homes , e) loneliness is most common among older people , and f) older drivers are more risky . Given that, as Susan Sontag noted about illness , negative perceptions feed into poor services – impossible to take up residence unprejudiced by the lurid metaphors with which it is landscaped – the persistence of these myths is the most harmful factor in undermining your chances of a contented old age. This was pointed out by Robert N. Butler, a pioneering geriatrician in the USA when he wrote over 40 years ago that the tragedy of old age is not the fact that each of us must grow old and die, but that the process of doing so has been made unnecessarily and, at times, excruciatingly painful, humiliating, debilitating, and isolating through insensitivity, ignorance, and poverty . Almost as toxic is that of age-denying positivism, the fretting upper-middle classes playing Nintendo brain games, eating oily fish and exercising to stave off their stereotypically negative view of ‘ageing’. This is of a piece with ageing-denying media images, and self-help books (for example Younger Next Year (when what is being offered is Less Frail Next Year) which deny the reality of ageing, ultimately spawning an ultimately nihilistic viewpoint where death is preferable to old age . Ironically, if you harbor a negative stereotype of ageing, you are more likely to die young , spend longer in hospital and respond less well to rehabilitation , and be more lonely as you age ! The concept of simultaneous growth and loss right into the tenth and eleventh decades is a challenging one, best illustrated by metaphor, and great artists provide the best metaphors. Not only do older artists provide us with the actual art of the longevity dividend but they also help us to learn the art of discussing and understanding the wonder of ageing . So, when students troop into my introductory lecture on geriatric medicine, they are generally surprised that the first slide is Henri Matisse’s The Snail (1953): radical, vibrant, and witty, it does not quite conform to their preconceptions of medicine with older people. The second slide, of the 83-year-old Matisse in a wheelchair, provides the context: his later life not only provides surprising developments in his art, but it occurs in the face of significant disability. Indeed, Matisse’s response to illness illustrates not just his resourcefulness, but also the role of adversity in sparking personal growth. This was most notable in his development of the technique of découpage, cutting out the shapes and applying gouache with the assistance of his students, to create an unforgettable series of large art works into his ninth decade. In the face of the almost invariably negative popular images of ageing, creativity in later life provides an invaluable lifeline to understanding the benefits of societal ageing, thereby transmuting the feared “grey tsunami” into a demographic dividend. Moreover, this artistic output generates powerful metaphors to illuminate the complexities of later life: although simultaneous growth and loss occur at all ages, society dwells on the losses of old age and fails to acknowledge not only the positives but also the increased interindividual variability that is one of the hallmarks of ageing — and a major source of intellectual challenge in geriatric medicine. The message is all the stronger for being delivered metaphorically, transcending supplication and the usually worthy tone of advocacy by harnessing the emotional, aesthetic, and transformative power of great art. And indeed the losses of later life are intrinsic to the gains of later life – in the words of Goethe, In der Beschränkung zeigt sich erst der Meister (it is being constrained that the master first shows himself). This is not some Polyanna-ish sentimentalization of the nobility of suffering but rather a reflection of one of the leading theories of ageing, the socio-emotional selectivity theory of Laura Carstensen , whereby the experience of, and proximity to, disability and death promote more meaningful and reflective choices about life. The art of the demographic dividend is the gift that keeps on giving, from the ruins and regrets of the aged Richard Strauss having lived through Nazi Germany in his Metamorphosen , through the hugely droll journey through illness of the octogenarian Dr Seuss , to the magnificent late movies of Clint Eastwood and laconic and subtle late albums of Leonard Cohen: his poetic words “like a broken-hearted banjo bobbing in a dark-infested sea” certainly resonate from private to public about a complex experience of ageing. To portray the art of late life, creativity is not to place old age on a pedestal. Evil can accompany the highly accomplished skills of later life, as exemplified by Robert Mugabe, Maréchal Pétain and Sepp Blatter. We need to engage with the wonder of ageing and the art of the demographic dividend all the while recognizing and planning for our existential vulnerability, as neatly caught by Thomas Kinsella in his poem, Legendary Figures, in Old Age. In particular, we need to remind ourselves that we have significant chance of spending some time of our lives with age-related disabilities, cognitive and physical, and demand a system that is age-proofed and dementia-proofed. We need to rethink our language and discourse, from ubiquitous and demeaning terms ‘elderly’  through ‘carer burden’  to apparently innocuous concepts such as “successful” ageing, and “active and healthy” ageing which may seem on the surface to be an improvement on earlier tropes, a moment’s reflection give grounds for concern. Are those who do not meet the parameters of “successful” ageing to be considered as “failed” ageing? Are those who are not, through any fault of their own, neither active nor healthy in later life, in some way to have achieved a lesser citizenship? Eminent commentators such as Alan Walker have noted how official conceptions of active ageing are strongly “productivist” rather than embracing a wider view of ageing. We need to think of forms of expression that value older people for what they are, regardless of their state and productivity, without in any way lessening our public health impulses to promote activity, social engagement, and health to the greatest extent possible, and as desired by the older person. “Optimal ageing” is a more flexible and less productivist phrase which relates to the values and wishes of the person to a greater extent than externally generated concepts such as “successful” or “active”. So stop fretting about brain-training and age-denying “anti-ageing” face creams and instead devote your energies to creating a political discourse that puts a premium on gerontological expertise in all aspects of life, not just healthcare, and where optimal ageing is identified as a common fate for us all. A particular focus should also be on nursing home care which is enabling and liberating to the greatest extent possible. It is now ten years since the release of the Leas Cross Report, and while much has improved through better regulation, it is really troubling that the design of nursing homes lags significantly behind the curve. Current thinking is to make small household units of 8-10 residents with a front door, dispersed sitting rooms, small dining room and facilities, which in turn feeds into shared facilities such as activities-rooms in a public spine in the building, ideally near to where the residents formerly lived. The horror of seeing Celtic Tiger hotels being converted to nursing homes suggests that, like the Bourbons, we have learned nothing and we have forgotten nothing. The locations of many nursing homes are distant from population centres, attenuating social contacts. You have to keep reminding yourselves that this could be you, we can do much better, and the key to this is to value our future selves and embrace our vulnerabilities. Go figure why we do not have these sort of issues with cancer and cardiac care: for these conditions, we can imagine that it might be me, and we value ourselves with these conditions and want the best possible treatment. Jagger C, et al. A comparison of health expectancies over two decades in England: results of the Cognitive Function and Ageing Study I and II. Lancet. 2016 Feb 20;387(10020):779-86. Satizabal C, Beiser AS, Seshadri S. Incidence of Dementia over Three Decades in the Framingham Heart Study. N Engl J Med. 2016 Jul 7;375(1):93-4. O’Neill D. A piece of my mind. To live (and die) as an original. JAMA. 2012 Aug 15;308(7):679-80. Breyer F, Costa-Font J, Felder S. Ageing, health, and health care. Oxford Review of Economic Policy. 2010 Dec 21;26(4):674-90. Stiglitz J. Securing social security for the future. The Economists’ Voice. 2005 Feb 9;2(1). Dykstra PA. Older adult loneliness: myths and realities. European journal of ageing. 2009 Jun 1;6(2):91-100. Hakamies-Blomqvist L, Raitanen T, O’Neill D. Driver ageing does not cause higher accident rates per km. Transportation Research Part F: Traffic Psychology and Behaviour. 2002 Dec 31;5(4):271-4. Sontag S. Illness as Metaphor. New York, Farrar, Straus and Giroux, 1978. Butler RN. Why Survive? Being Old In America. New York, Harper & Row, 1975. Emanuel EJ. Why I hope to die at 75. Atlantic. 2014 Oct.
 Levy BR, Slade MD, Kunkel SR, Kasl SV. Longevity increased by positive self-perceptions of aging. J Pers Soc Psychol. 2002 Aug;83(2):261-70. Levy BR, Slade MD, Murphy TE, Gill TM. Association between positive age stereotypes and recovery from disability in older persons. JAMA. 2012 Nov 21;308(19):1972-3. Pikhartova J, Bowling A, Victor C. Is loneliness in later life a self-fulfilling prophecy? Aging Ment Health. 2016;20(5):543-9. O’Neill D. The art of the demographic dividend. Lancet. 2011;377(9782): 1828-1829. Carstensen LL. Motivation for social contact across the life span: A theory of socioemotional selectivity. Nebraska Symposium on Motivation 1992;40:209–54. O’Neill D. Burdensome aspects of care rather than caregiver burden. Lancet. 2015 Oct 3;386:1340. Richardson S, Karunananthan S, Bergman H. I May Be Frail But I Ain’t No Failure. Can Geriatr J. 2011 Mar;14(1):24-8.